Left hand balance, or the natural and efficient distribution of weight among the fingers, is an important element of string playing. It contributes to comfort, facility, and consistency of intonation. It is also essential to proper form for extensions and double-stops, which occur throughout the Suzuki violin and viola repertoire. I became interested in left hand balance several years ago in my own lessons. I had a habit of squeezing the neck with my left thumb, making it difficult to adjust the intonation of double-stops. My teacher, Denise Lupien, taught me to redistribute weight toward the second and third fingers, or center of the hand. This took pressure off the first finger and allowed my thumb to relax, freeing up my hand to make necessary intonation adjustments. I was impressed by this change, and looked for ways to apply it in my teaching. Figure 1: Excess first finger weight. Note the compaction of the space between first and second finger. 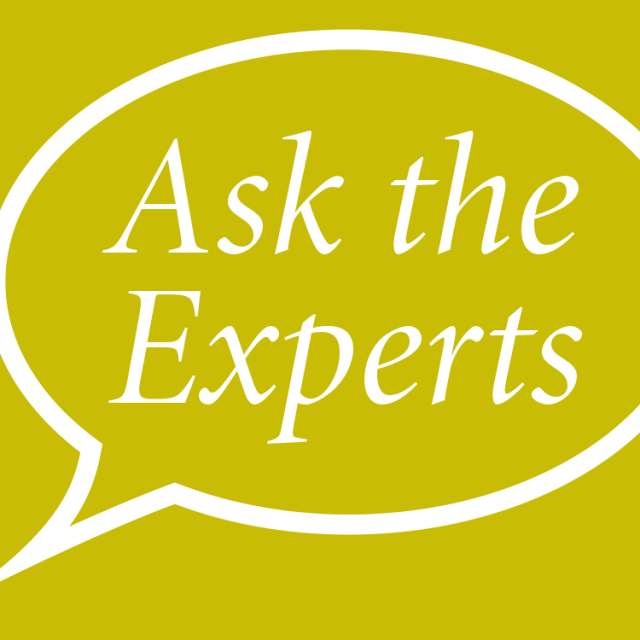 Why is left hand imbalance so common? Perhaps because as violinists and violists, we are very oriented toward the first finger, both physically and mentally. Beginners typically learn to place the fingers in consecutive order, “building” them starting with first finger. Later, we identify positions based on the location of the first finger, and use it as the primary guide finger when shifting. While these are generally good habits, they may lead some players to become overly reliant on the first finger. Posture also plays a role. If a student is using a shoulder rest properly, the weight of the head will fully, or almost fully, support the violin. The body, head, and instrument will counterbalance one another so that the left hand does not have to actively hold the instrument in place. When there is an imbalance of any one of these elements, the left arm and hand will feel the need to compensate and create stability by gripping. Another explanation for left-hand imbalance is offered by Hungarian pedagogue Kató Havas in Stage Fright: Causes and Cures, who suggests that an underlying fear of dropping the instrument may contribute to left hand tension. This can be addressed by rebalancing posture and with exercises such as dropping the hand while practicing. Figure 2: Balancing from the center. Note that each finger has access to its full range of motion. To get a feel for balancing from the center, rest your scroll on a shelf at chin-level. Set your second and third fingers on the fingerboard in first position and allow your arm to hang from the fingerboard for a few seconds. Feel the weight of your left arm in your fingertips. Then tap your first and fourth fingers lightly, one at a time. Note the different pressures of the core versus the “accessory” fingers. Now, try extending first and fourth finger back and up without disturbing the shape of the center of the hand. Do you notice a difference in terms of their ease of movement? You can try this with a student by holding the scroll in place with your hand [Figure 3]. Figure 3: Hanging exercise with a student. It is interesting to note that the center model mirrors finger function on the bow. A well-formed bow hold is based around a core of second finger, third finger, and thumb. In general, the first and fourth fingers are complementary to that center. 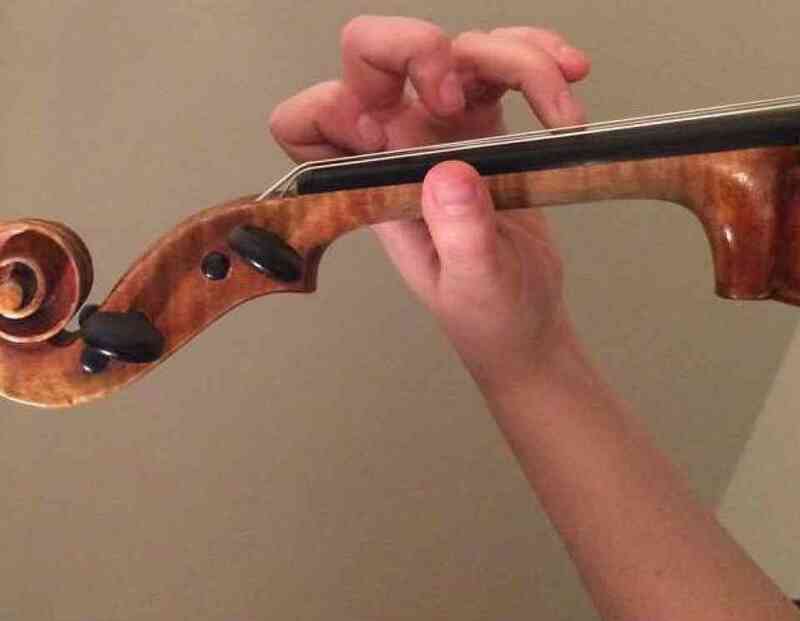 They have a more variable repertoire of pressures that enable different bow strokes, and, in the case of the first finger, allow us to sustain tone in the upper half. Pointing out symmetry between the hands may help the center model click better for some students. The center model is described in various ways in traditional pedagogy textbooks. 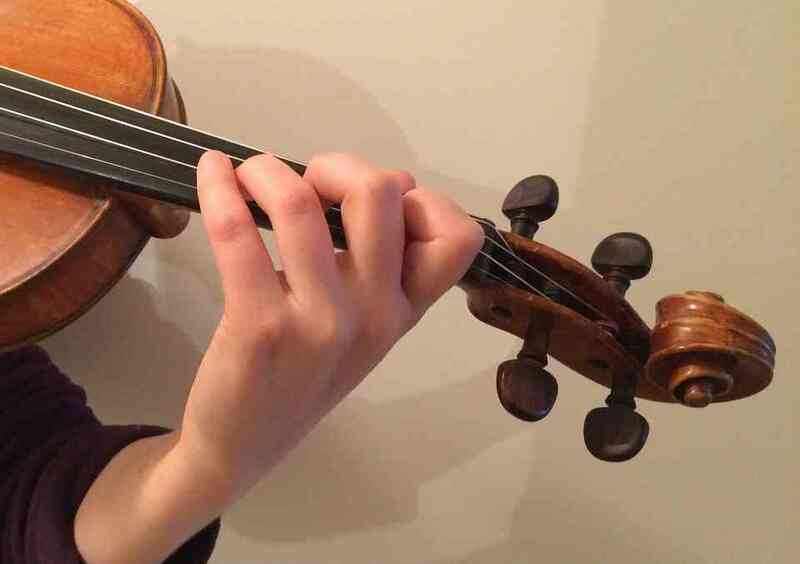 In Principles of Violin Playing and Teaching, Ivan Galamian discusses the pitfalls of thumb clenching and the importance of maintaining the octave frame in the left hand. He offers an exercise for shifting balance away from the first finger, in which the player sets the fingers consecutively in relation to the fourth [Figure 4]. Figure 4: Exercise for maintaining the octave frame from Ivan Galamian, Principles of Violin Playing and Teaching, 21. Similarly in Basics, Simon Fisher presents exercises that he classifies under “reaching back from the fourth finger” [Figure 5]. He advocates widening at the base joints rather than compacting the hand, and illustrates a hand position for thirds that is based on the third finger (p. 102). Furthermore, he recommends setting the third finger prior to the first, taking care not to disturb its shape. Fisher also advocates different centers of balance based on hand size: first or second finger for large hands, and second finger for small hands. Indeed, the center model may be particularly useful for younger students and those with smaller hands. Figure 5: Exercise for reaching back from the fourth finger in Simon Fisher, Basics, p. 100. It is important to acknowledge that the center model respects the design of the hand. It gives each finger, particularly first and fourth, room to separate from its bottom (or metacarpal-phalangeal) joint. Furthermore, the center model allows for more freedom within the palm. 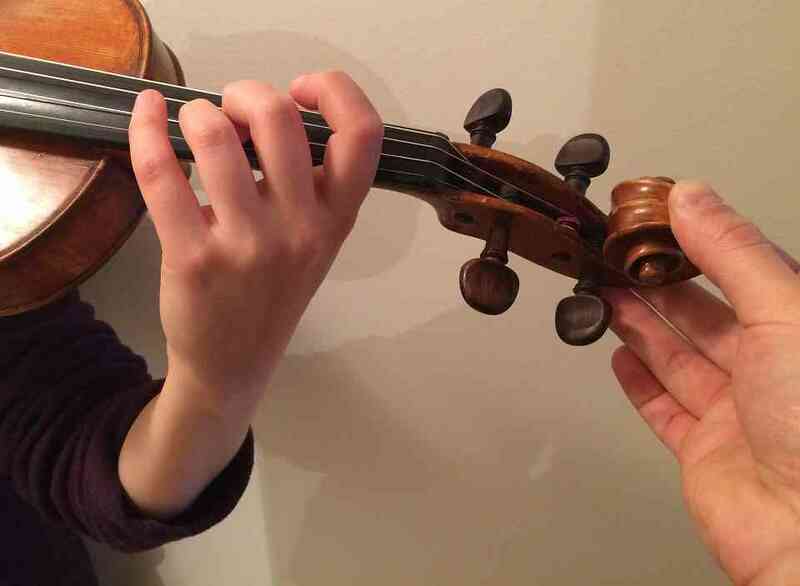 As violinists and violists, we move our fingers mostly from the bottom joints, but it is also important to have a feeling of openness in the palm, where the finger bones meet the wrist bones (at the carpo-metacarpal joints). This gives each finger its full range of motion [Figure 6]. 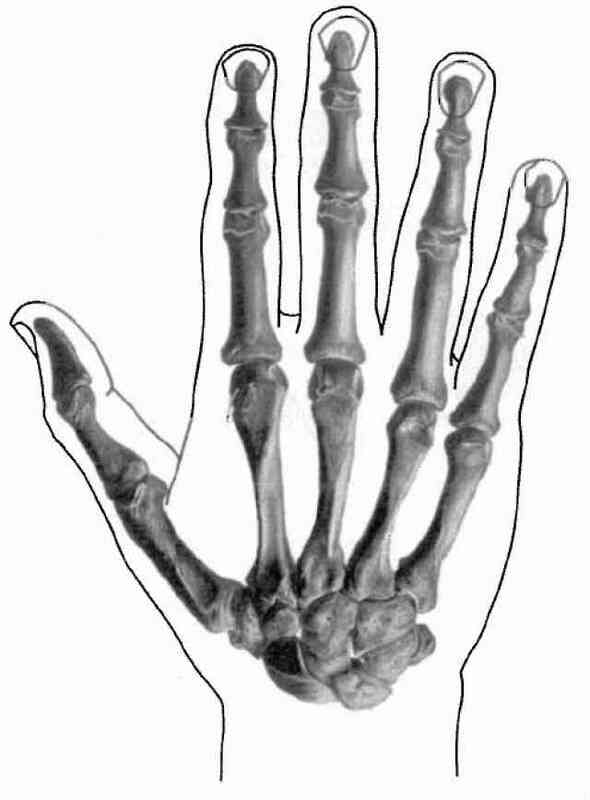 Figure 6: Bones of the left hand in Barbara Conable, What Every Musician Needs to Know About the Body: The Practical Application of Body Mapping to Making Music. Many students are new to the idea that finger bones extend into the palm, so it may be helpful to post a diagram of hand anatomy in your studio, as recommended by Jennifer Johnson in What Every Violinist Needs to Know About the Body (p. 4). It can also be helpful to mark the metacarpal joints in marker on students’ hands, or tap either side of the metacarpal joint as a student plays a simple passage. When students can envision the location of these joints, they will have a better understanding of why releasing weight from the first finger is advantageous. In the Suzuki violin repertoire, we first encounter an extension in Book Two, with The Two Grenadiers by Robert Schumann [Figure 7]. According to the center model, the third finger will serve as an anchor throughout the first measure. It will maintain a natural shape and contact the string on its inside corner. The first finger, in contrast, will extend back and contact the string more on its side [Figure 8a, 8b]. It will be lighter than the third finger. In my teaching, I call third finger the “rock” and first finger the “feather” to emphasize their different roles. I make sure students understand that weight distribution is all relative: the second and third fingers need only enough weight to press the string to the fingerboard and produce clear tone. These fingers should anchor the hand without squeezing. Figure 7: Opening of The Two Grenadiers in Suzuki Violin School Volume 2 Revised Edition, 19. Figure 8a: Balance of left hand for opening of Two Grenadiers. Note how the third finger serves as an anchor while first finger extends back. Figure 8b: Balance of left hand for opening of Two Grenadiers. Note how the third finger serves as an anchor while first finger extends back. It may be helpful to use the following D minor Tonalization as a preview to Two Grenadiers. This exercise allows students to focus their attention on left hand balance and tone production. Listen for the ringing tone on D both times that it is played. Note that if a student shifts weight to the F-natural, rather than keeping it light, the intonation of the final D will usually be flat, as a result of it being “pulled back” towards first finger. Figure 9: D minor Tonalization exercise. If we fast-forward in the violin repertoire to Corelli’s La Folia in Book Six, the same D and F-natural occur as a double-stop at measures 85 and 161. Of course, the same hand configuration and distribution of weight should apply here. The above D minor Tonalization is applicable here, as well. Figure 10: Measure 161 from Corelli’s La Folia in Shinichi Suzuki, Suzuki Violin School Volume 6, 9. A student with good left hand balance will be able to tune this minor third in this measure by adjusting the first finger only (assuming the D is a ringing tone to begin with). 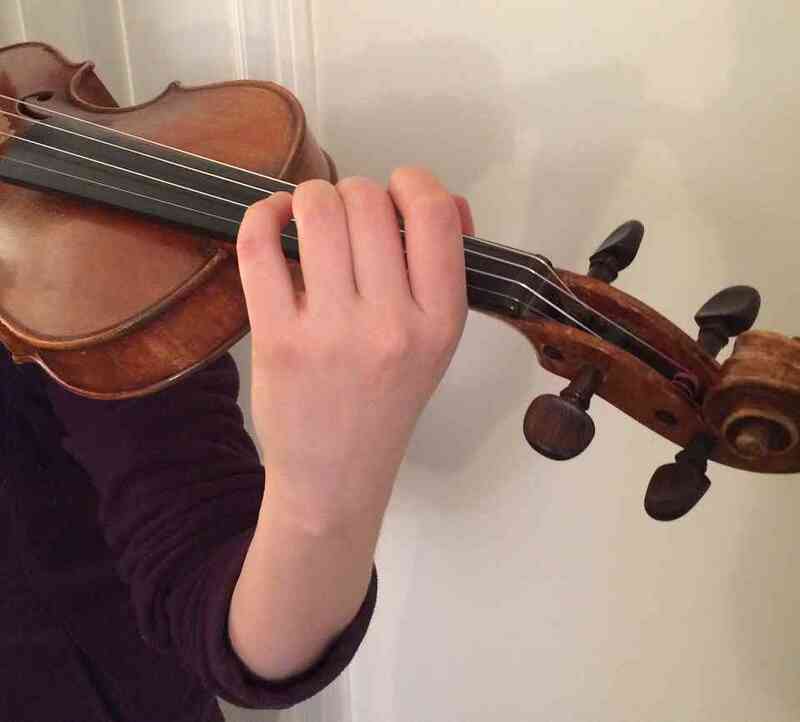 A student whose left hand is off-balance will try to tune both notes of the double-stop simultaneously. This is, of course, a poorly-conceived strategy. I think that tuning a double-stop is a lot like searching for a friend in the woods; it is best when one person searches while the other stays put! Therefore, one finger should remain constant while the other adjusts to it. Most of the time, one of the anchor fingers will be the constant to which one of the accessory fingers adjusts. Students can encourage the first finger to adjust independently of the third by raising then lowering the upper pitch by a quartertone (or in terms of pitch frequency, 50 “cents”). They can find their way back to the original pitch each time by listening for the purity of the interval. Figure 11: Double-stop tuning exercise for La Folia. By Book Six, students should be able to recognize the different (or “Tartini”) tones that occur when the notes of a third or sixth are played perfectly in tune, as well as the unique sonorities of perfect fourths, fifths, and octaves. They should be able to make the adjustments that are needed to create perfectly-tuned intervals by balancing from the center of the hand. Outside of the Suzuki repertoire, Josaphine Trott’s two volumes of Melodious Double Stops are excellent for reinforcing these skills. The above examples illustrate the hand position for one particular interval, D and F-natural, played melodically and harmonically. The center model, however, can be applied throughout violin Books Two and Three, especially in pieces like Witches’ Dance by Paganini and Gavotte in G minor by JS Bach, as well as in Concerto in G minor by Vivaldi in Book Five. If we are careful about left-hand balance in this early repertoire, students will have a clear path in front of them as they progress to more advanced pieces. Books Two and Three are great places to start applying the center model, but ideally teachers should set students up with proper left hand balance from the beginning. Some teachers may want to explore a new order of finger placement in Twinkle, for example, starting with second and third when building fingers. Another valid approach would be to teach a piece like French Folk Song, which emphasizes the second and third fingers, before Song of the Wind in Book One. Teachers can experiment and share their own ideas about this with one another. It can be very helpful to play two-octaves scales on the second and third fingers only. These can be played in any key and they help recalibrate the left hand toward the center. Two examples are illustrated below [Figure 12]. Figure 12: Two-octave scales on second and third finger in B-flat Major and E minor. Of course, these fingerings require advanced shifting skills. For younger students who do not yet shift, the exercise on the following page may be more suitable. Parts I and II of this exercise establish the centrality of second and third fingers through isolation and repetition. Part III encourages the fourth finger to balance off of the center through various four-note patterns. The 33 patterns shown utilize the second, third and fourth fingers at least once each; other patterns are certainly possible. I have found this exercise to be effective both for “remedial” students with left hand balance issues, as well as for new students learning to set fourth finger for the first time. 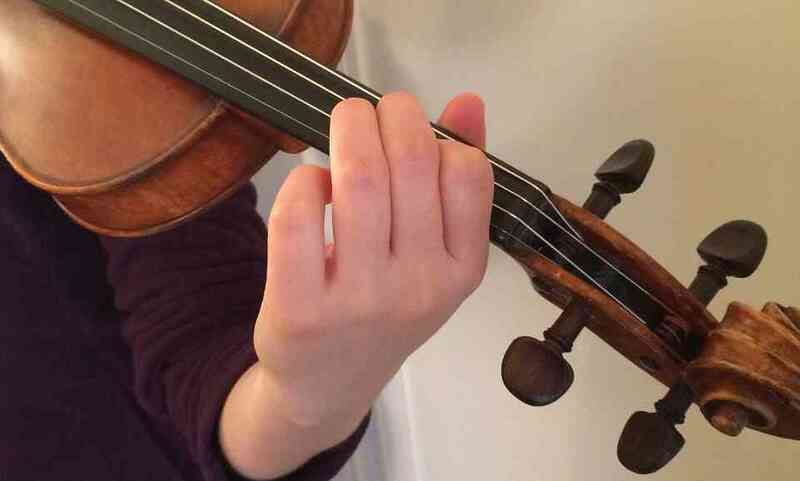 Many violin and viola students put excess weight on the first finger. This limits the range of motion of the left hand and causes a variety technical problems, including difficulty reaching fourth finger. Balancing from the center, or second and third fingers, corrects these issues and clears the path to more fluid left-hand technique. The “center model” is alluded to in various violin pedagogy textbooks, and it applies to many pieces in the Suzuki violin and viola literature, starting with The Two Grenadiers. In the first measure of this piece, students can practice balancing on the third finger while extending the first finger back. This principle applies to extensions and double-stops in the later Suzuki repertoire and more advanced supplemental repertoire. Students can recalibrate left-hand balance through scales on second and third finger, and through the Balance Etude provided. Teachers may also want to experiment with teaching finger placement in a different order at the Pre-Twinkle level, in order to encourage good balance early on in students’ development. Conable, Barbara and Conable, Benjamin. What Every Musician Needs to Know About the Body: The Practical Application of Body Mapping to Making Music. Andover, 2000. Fisher, Simon. Basics. London: Peters Edition Ltd., 1997. Galamian, Ivan. 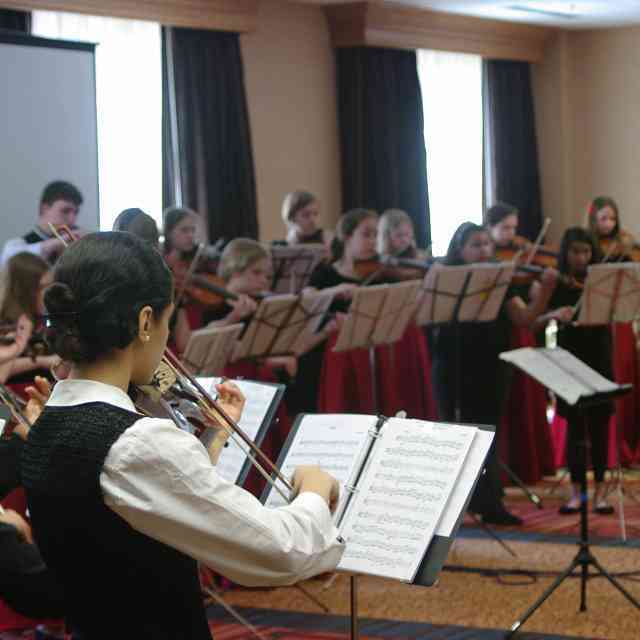 Principles of Violin Playing and Teaching. Englewood Cliffs: Prentice-Hall, Inc., 1962. Havas, Kato. Stage Fright: Its Causes and Cures. London: Bosworth, 2003. Johnson, Jennifer. What Every Violinist Needs to Know About the Body. Chicago: GIA Publications, Inc., 2009. Kempter, Susan. How Muscles Learn: Teaching the Violin with the Body in Mind. Summy-Birchard Inc., 2003. Trott, Josephine. Melodious Double Stops: Complete Books 1 and 2 for Violin. G. Schirmer, Inc.
Suzuki, Shinichi. Suzuki Violin School, Volumes 1-6. Summy-Birchard Inc., 1931.
. This can be trained by playing scales and Book One repertoire in double-stops, first as duets with the teacher, then alone.
. This approach, advocated by many teachers, is described by Susan Kempter in How Muscles Learn: Teaching the Violin with the Body in Mind, 83-87. Ellen Kogut holds Master’s degrees in Suzuki Pedagogy from Ithaca College and in Violin Performance from McGill University. 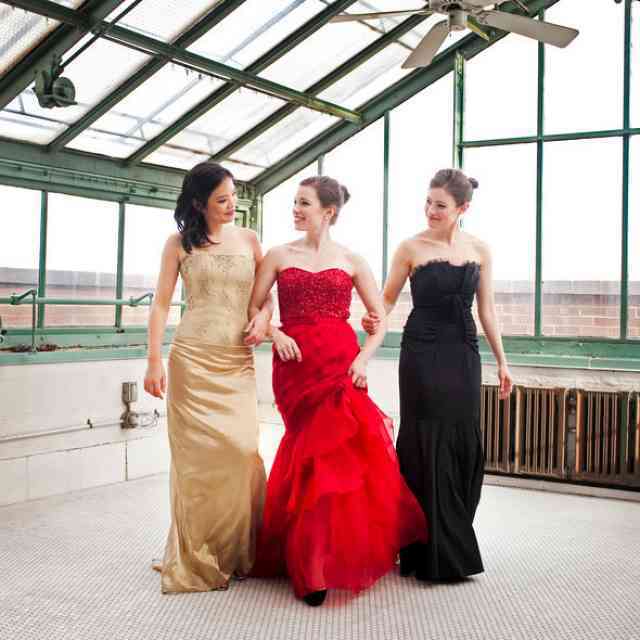 She has taught at Suzuki workshops and institutes in Canada and the U.S., and maintains an active performing career as a chamber and orchestral musician. 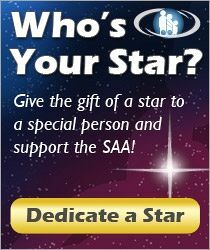 She currently serves on the SAA’s Board of Directors and is completing a doctorate in violin performance at l’Université de Montréal.